This at its full Growth is a large and very long Snake, some being six Feet in Length. They are all over of a shining black, never changing then Colour. They are very nimble and beneficial in killing Rats, which they pursue with wonderful Agility to the Roofs and all Parts of Houses and Barns, where Rats are able to run; for which Service they are preserved by most of the Inhabitants. They are bold and furious, leaping at and biting those that attack them, tho' no Harm ensues, their Bite not being venomous. 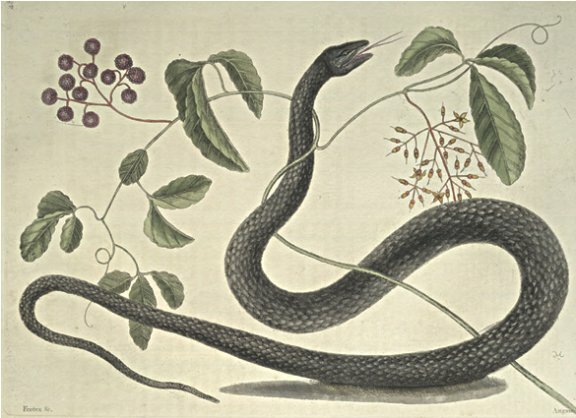 It is commonly said in Carolina, that they will attack and swallow Rattle-Snakes; it is certain most or all Snakes will devour one another, not only of their own, but of other Kinds; which I have often seen after a long Struggle, one swallow another, but little less than itself: They are the most numerous of all the Snakes. This twining Plant supports itself by Trees and Shrubs that grow near it, on which they twist, and are assisted by small Tendrils: From the main Stem grow alternately smaller Branches, with trifoliated leaves, which are indented round the Edges, on Footstalks an Inch long: The Flowers are very small, in Form of a Cup divided into four pointed Petals, growing in Spikes many together, on very short Stalks. The Buds of the Flowers before they open, are in Shape of an Acorn. The whole Spike of Flowers with their Stalks are red, except the Tops of the Buds, which are yellow. The Berries are of the Size of large Peas, of a purple Colour, round, with Protuberancies like those of Mulberies, and contain such like Seed: One long red Stalk, dividing into smaller curved Pedicles, supports the Fruit, which were strait while the Flowers remained. This Plant was in Bloom and Fruit at the same Time, which was in May, on the Island Ilathera.